We're excited to announce today that for the first time highly customized sponsorship intelligence, tailored uniquely to your property and updated in real-time, is now a reality. If you spend a lot of time wading through the same reports every sponsorship seller is reading hoping for a lead or two that may be relevant, you're going to love customized research. 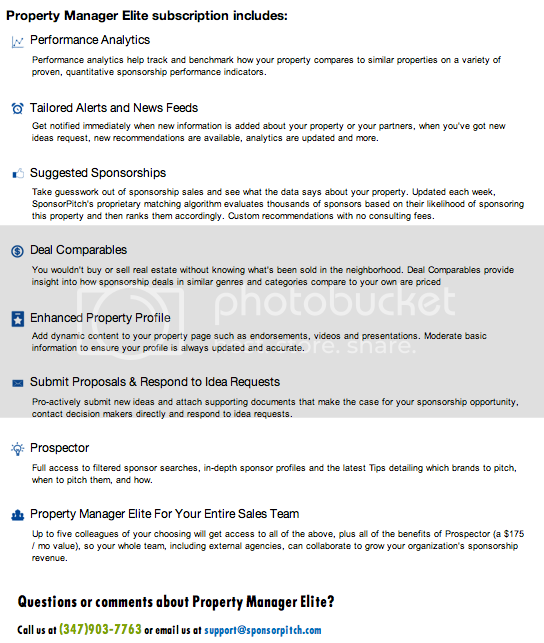 Property Manager Elite uses algorithms to customize all of the information on SponsorPitch and pull out the most relevant information to your organization arming your sales team with a steady stream of hand-picked actionable data such as most active/recent sponsors in your area, most active/recent sponsors for your event type, personalized sponsor recommendations, analytics, comparables, alerts and more. Here's the skinny on some of the benefits your sales team gets and how to get started at the introductory rate (offered through 11/22/13). #1: For anyone that has signed up for an annual Prospector subscription prior to today (11/12), you may apply your pro-rated credit towards Property Manager Elite if you prefer. To do so, send a request to support@sponsorpitch.com. Prospector will remain available, but if you want custom research at a great value + all the benefits of Prospector for your whole team, Property Manager Elite will be the way to go. #2: Discounts are offered for multiple Property Manager Elite subscriptions. Contact us at 347-903-7763 for applicable rates. #3: If you don't see the green Add Elite button on your dashboard, it's likely because you haven't yet created a property page. To do so, click 'Add A Property Page' and follow the steps.